Ride to Normandy for ABF The Soldiers’ Charity. Join us to commemorate the 75th Anniversary of the Normandy Landings by cycling to the landing beaches and battlefields of the Battle for Normandy 1944. Take on the 310-mile challenge! This cycle ride will be a tough physical challenge – we’ll be covering over 60 miles a day – in difficult and challenging terrain. Show your support for our soldiers today by taking part and raising money in aid of ABF The Soldiers’ Charity, The Army’s National Charity, helping soldiers, veterans and their families since 1944. You will enjoy the same level of care as in previous rides with ABF The Soldiers’ Charity including an historian to bring the battle to life, full vehicle support, mechanic, doctor, three meals a day (other than on the ferry) and a route which we genuinely believe is unique and far better than other ‘D Day’ charity rides as you will experience the complete extent of the Normandy battlefield and not just the coastal strip on your way through. Registration will take place at Portsmouth Ferry Terminal on Monday 5 August 2019 for an overnight channel crossing to Ouistreham. From there the cycle route will cover all the main Allied landing beaches and memorials including Arromanches and the remains of the Mulberry Harbours to the Pointe du Hoc above the US landing beach. The route will then cover areas which saw action in 1944 during the Battle for Normandy to the south of Bayeaux covering the intense fighting around Falaise and Alencon. The return route to the ferry port will visit the famous airborne actions at Merville and Pegasus Bridge before returning to Portsmouth by early evening on Saturday 10 August 2019. During this commemorative cycle ride, you will pass places of huge significance that changed the course of history and there will be ample opportunities to pay your respects to the sacrifices made by British, American, Canadian and other Allied Forces. Registration will take place in Portsmouth Ferry Port on the evening of Monday 5 August 2019 prior to taking the overnight ferry to Ouistreham. Riders will then cycle through Normandy visiting the important sites of the Battle for Normandy to commemorate those events 75 years on. Overnight stops will be in Bayeaux, Falaise, Alencon and Lisieux before returning to Portsmouth on Saturday 10 August 2019. The route is classed as difficult. There are a great many places to see along the way so plenty of opportunities to stop should you wish – indeed we recommend pausing to make the most of the places we pass. There will be planned refreshment stops during each day which will include an historical briefing by the event battlefield tour guide, Graeme McDonald. Day 1, Monday 5 August 2019: Porstmouth to Ouisterham. Evening registration at Portsmouth Ferry port for an overnight channel crossing to Ouistreham by Brittany Ferries. Parking is available at the port and train terminals at Portsmouth and Southsea. Disembark and briefing before visiting the British and Canadian Sword and Gold landing beaches to include Arromanches and the remains of the Mulberry harbour and the assaults on Longues Battery. From there a poignant visit to the US cemetery at above Omaha Beach and the assault on the Pointe du Hoc. From Bayeaux the route covers the bitter fighting by British forces to force the Germans to surrender Caen. We ride through villages such as Tilly-sur- Seulles which changed hands 23 times during the battle. From there to Hill 112 with its grandstand view of Caen and a lovely route to Villers Bocage and then climb Mont Pincon, the highest point in Normandy and then traverse the Suisse Normande to Falaise. The ride in beautiful countryside south of Falaise belies the intensity of the fighting that took place in August 1944. The route goes through the ‘corridor of death’ as British and US forces enveloped the German Army and saw desperate fighting as it tried to withdraw. A number of interesting sites will be visited prior to riding to Alencon for the night. Riding north we skirt Argentan and climb Montormel where we visit the site of the desperate defence by our Polish allies before being relieved by the Canadians on 22 August which effectively ended the Battle for Normandy. The views from the hilltop are very commanding. The route continues via Vimoutiers where the only remaining German Tiger tank can be seen before riding to Lisieux where the last night dinner awaits. A predominantly flat and fast run takes us through the airborne assaults at Merville Battery and Pegasus Bridge pausing at Café Gondrin, the first house liberated before a short ride to Ouistreham for the afternoon ferry to Portsmouth. Accommodation is provided – Ferry Crossing and 5 nights in 3*** hotels; breakfast, evening meal and picnic lunch included. Food and water stops will be programmed along each daily route. Baggage transport will be provided along the route. Medical and mechanical support is also provided. Minimum sponsorship target: Riders taking part must commit to raising £1,250 in sponsorship. This does not go towards the sponsorship target that each rider will commit to raise. This registration fee may be paid in two instalments, no more than 3 months apart, by prior agreement with the organiser. Riders must also commit to raise £1,250 in sponsorship for ABF The Soldiers’ Charity. The charity will provide help, support and fundraising tips and ideas to help you achieve this target. Early registration will allow you longer to reach your target and the highest three fundraisers will each be presented with a special commemorative jersey by The Soldiers’ Charity to record their thanks. Registration for the event is through our event partners, Green Jersey French Cycling Tours. The easiest way to fundraise is to set up a JustGiving page that you can share with friends and family. Please create your page here so that the charity can easily identify how much is raised by the event. This will ensure that money raised is correctly allocated to your fundraising efforts, so it is important to get this information correct. You pledge to raise a minimum of £1,250 in sponsorship. You can make up the balance yourself should you not reach this target. There is no maximum limit. 85% of your target (£1,062.50) should be sent to ABF The Soldiers’ Charity by 1st June 2019. If you do not pay a minimum amount equal to the price stated in clause 1.13 we reserve the right to cancel your place which will constitute a cancellation by you under section 2 of these terms and conditions. The remainder of your fundraising monies is due 4 weeks after your return. You must maintain accurate records showing how much money you have raised and allow ABF The Soldiers’ Charity to access these at any time. Once you have raised 85% (£1,062.50) of the minimum sponsorships (due 1st June 2019), your place will be confirmed. 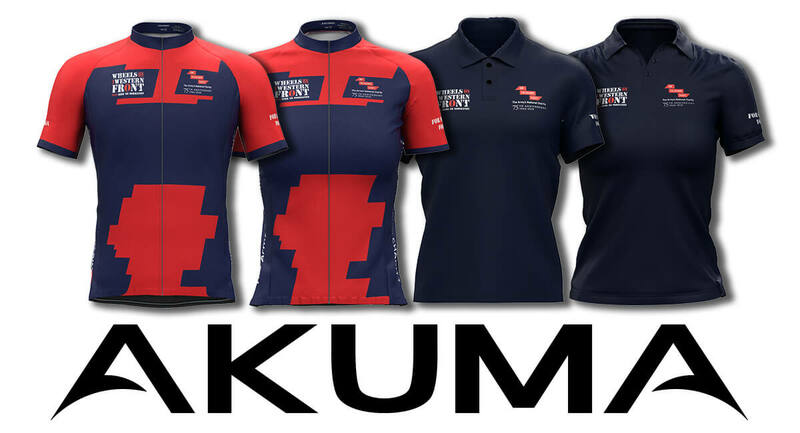 We are very grateful to Akuma for working with us once again on this event. Orders will be processed on 18 March, 8 April, 6 May, 3 June and 1 July (last order). All shirts are bespoke and take four weeks to manufacture. Take a look at what some of our riders have said about their experiences on Wheels on the Western Front. Please send us your completed and signed copy of our Booking Form by email or post. Submission of the booking form is deemed to be acceptance of these Terms and Conditions. If booking by post please also send a cheque for the deposit with your booking form. On receipt of your booking form Green Jersey Cycling Tours Ltd will issue a Booking Confirmation and (receipted) invoice for the deposit, which should be paid by paid by bank transfer. Details will be provided on the invoice. Cheques should be made payable to ‘Green Jersey Cycling Tours Ltd’. Deposits become due within 7 days of invoice date and after this period your registration will lapse if the deposit has not been received. If you need several more days please telephone before expiry of the 7 day period and we will extend it further. If we do not receive your deposit within 7 days or more time has not been negotiated as per clause 1.4 we reserve the right to allocate your space to someone else. Payment of deposit is existence of a contract between us and agreement to these terms and conditions. We will submit an invoice to The Soldiers’ Charity for the balance of your event cost which becomes due 8 weeks before commencement of the event. The Soldiers’ Charity will pay the balance of the cost subject to their having received a percentage of the minimum fundraising amount as set out in 1.12 and 1.13. If that amount is not received in a timely manner this will constitute a cancellation by you (see paragraph 2.4 below) and you will still remain personally liable for the cancellation charges. Whilst the Soldiers’ Charity will pay the balance subject to the clauses above, ultimate responsibility and liability for the trip cost remains with you and the contract is between Green Jersey Cycling Tours Ltd and you. We and/or The Soldiers’ Charity will from time to time send out fundraising tips and ideas to help you raise the minimum amount. Please feel free to contact us or The Soldiers’ Charity at any time for advice on fundraising. It is important that these rules are followed. Breaking these provisions would mean you commit a criminal offence under the terms of the Charities Act 1992. 1.14 Green Jersey Cycling Tours Ltd reserve the right to increase the amount of the balance due should the currency exchange rate drop below 1.1 Euros to the Pound Sterling. This clause will be invoked only at the time of payment of accommodation, transport and other suppliers who are paid in Euros and will be limited to an amount equal in percentage terms to the difference between the exchange rate at that time and the exchange rate as set out above. The exchange rate shall be defined as the commercial rate provided by Lloyds TSB. The deposit is non-refundable unless we are able to reallocate your place in which case a £50 cancellation charge will be levied. We will only reallocate your place to someone on a waiting list. A waiting list will be in operation only after all places have been allocated through the normal registration process. After payment of deposit but before sponsorship is paid, the deposit is forfeited in full. After payment of sponsorship but not less than one month before the start date, the greater of the deposit or 50% of the total paid will be forfeited. Less than one month before the start date, the full costs will be forfeited. You expressly agree that any monies recovered by you from your travel insurance which relate to sums paid on your behalf by The Soldiers’ Charity will be reimbursed to The Soldiers’ Charity. If you cancel or are required to withdraw from the trip you will be required to send all sponsorship forms and money collected directly to ABF The Soldiers’ Charity. This may well be retained by ABF The Soldiers’ Charity. If your sponsors wish to request a refund of their donations then they must apply in writing to ABF The Soldiers’ Charity. If we cancel the event we will offer you an alternative departure date if possible. You are not obliged to accept our offer of an alternative date and can instead opt for a full refund, including deposit, of all monies paid by you to Green Jersey Cycling Tours Ltd.
You should ensure that you have adequate insurance in place to cover you should we be forced to cancel your trip to cover those amounts paid to suppliers other than us (e.g. travel arrangements). If you are delayed in joining the start or need to curtail your participation, we will not offer any refund. You will be responsible for making your own travel arrangements at your own cost from the point where you join or leave the event. You should ensure that you have adequate travel and medical insurance in case of this eventuality leading to your curtailment of the event. All reasonable care is taken to ensure that the arrangements are as advertised. We take great care to ensure that only the most suitable accommodation is used and that the routes offer the best cycling on offer. However we retain the right to alter these arrangements. If there is a ‘significant variation’ to the advertised itinerary we will offer you the same options as set out under ‘Cancellation by us’ above. The start or finish point is changed by more than 15 miles. You are required to wear a cycling helmet at all times when on the bicycle. You will not touch, disturb or remove battlefield artefacts that you may find. This is especially important in the case of ordnance and shells (even if in your own judgement they are empty cases) which even today may explode. That, if in the opinion of our tour leaders, guides, assistants or any employees, directors or staff of Green Jersey Cycling Limited, your continued presence on the event represents a threat to or risk to the safety of other participants, or if your behaviour is of an anti-social or offensive nature, we retain the right to curtail your holiday immediately without compensation and that you will be responsible for your onward travel arrangements and costs. In the event of force majeure, we will not be able to refund or offer alternative dates. Your travel insurance should cover this event. Accommodation, as described on our website or in our literature, is subject to change without notice. We are constantly striving to offer the best value for money that we can find and sometimes we decide to change suppliers in order to meet this aim. Our itinerary includes transfers as stated in the description, including return ferry travel and coach transfer back to the start. If you miss any element of these arrangements you are responsible as per clause 4.1. You are responsible for making your own arrangements at your own expense either to the start and end points or to one of the designated pick up points as described by us. If you are denied entry to Belgium or France, or back into the UK and are unable to continue, this will be treated as a cancellation by you as per paragraph 2. If you are delayed in joining as a result, paragraph 4.1 will apply. You agree to arrange suitable travel insurance for the type of activity that you are undertaking, including cover for equipment either owned by you or hired from us or our agents, to include medical cover and repatriation in the event of injury or death. If you have any complaints during your event you should firstly bring these to the attention of our tour manager at the time. If the matter is not satisfactorily resolved you should write to us within 14 days of the end of the event. We will respond within a further 14 days, or, if further investigation is needed, within 14 days telling you when you may expect a response. Bun House, Cattistock, Dorchester, Dorset DT2 0HY England.